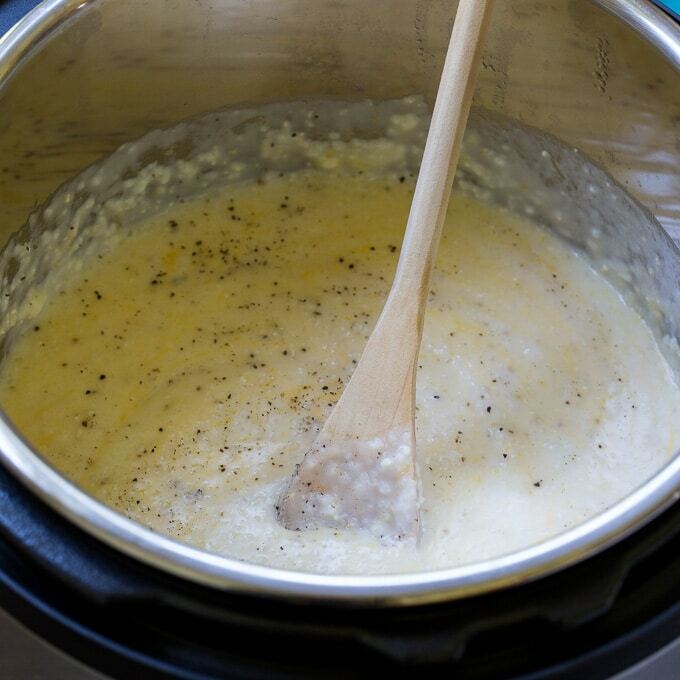 Instant Pot Grits just might be the creamiest, most delicious grits you ever tasted. No more standing over the stove stirring. The pressure cooker does all of the work for you. And no lumps! Whether served for breakfast or as a base for Shrimp and Grits, this is the easiest, most delicious way to cook grits. The texture is out of this world. This Instant Pot Grits recipe uses stone ground grits. They are by far the most flavorful grits but they take the longest to cook. Thankfully the Instant Pot reduces the cooking time. In order to keep them from sticking to the Instant Pot, you’ll need to saute them first in some bacon grease or oil. Use bacon grease if you have some. It adds wonderful flavor. Next, add water, some half-and-half or milk, salt, and butter. Set the Pressure Cooker on HIGH for 10 minutes. Allow the Instant Pot to release pressure naturally for 15 minutes and then release the remaining pressure manually before removing the lid. Stir in a little cheddar cheese and your grits are ready to serve. 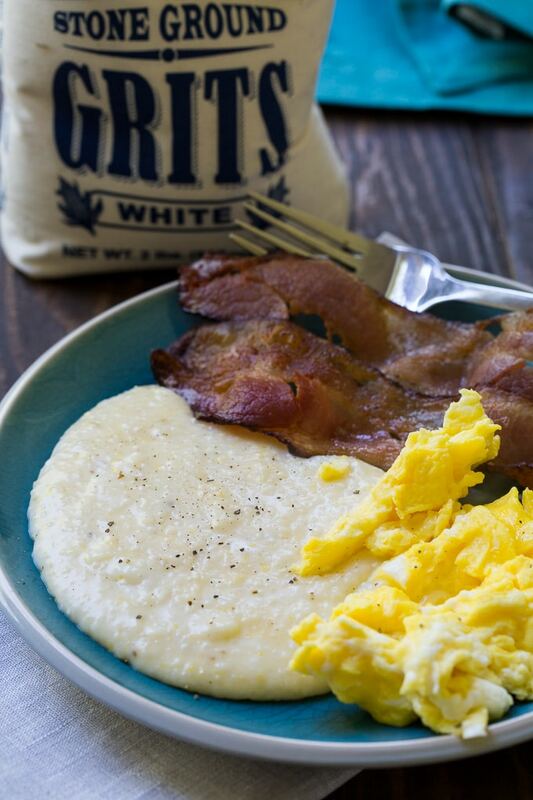 I’m a huge fan of Palmetto Grits which can easily be purchased online. Watch the short video below to see how to make Instant Pot Grits. Add bacon grease or oil to inner pot of Instant Pot. Turn "Saute" mode on. Once hot, add grits and cook and stir for 2 minutes. Add water, half-and-half, salt, and butter. Turn Instant Pot off, place lid on with valve in "sealing" position. Set to Pressure Cook on HIGH for 10 minutes. Allow a 15 minute Natural Release and then manually release the remaining pressure. Remove lid and stir in cheese. Stir well. 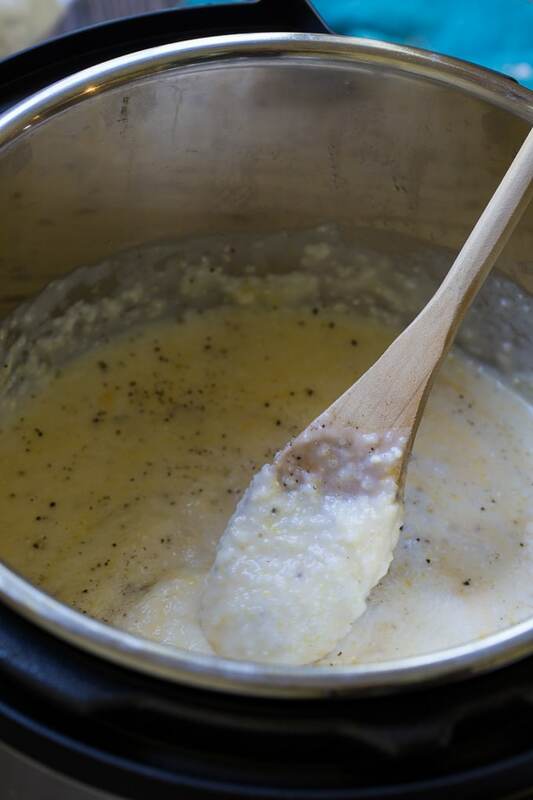 Grits will thicken up some as they cool slightly. Note: Cooking time does not include time for Instant Pot to pressurize. This can take about 10 minutes. This entry was posted in Breakfast, Instant Pot and tagged grits. Bookmark the permalink. Made these today with stone ground grits and followed the recipe exactly. Not only were the grits incredibly soupy, but the bottom was burned and they were undercooked. After looking around at some other recipes for stovetop stone ground grits it looks like this recipe uses more liquid than most despite the instant pot not losing as much volume through evaporation like you would on the stovetop. I think the technique will work—I’ll just try another recipe next time. will this work with old fashioned grits as well as stone ground? I have old fashioned grits I need to use up. Yes, I just did that this morning. DELICIOUS. I also didn’t use salt, since there’s plenty in the cheese (aged cheddar) and the butter (didn’t have unsalted). ENJOY!! I made 1/2 the recipe in my 3 qt instant pot. Turned out great. TFS. I am so eager to try this. I have a two quart pressure cooker I got on QVC, will this recipe work in my pressure cooker? I used the same exact grits! I doubled the recipe, only used about a teaspoon of salt and used organic skim milk! They turned out PERFECT!! Yummy goodness!! **TIP: Regular grits will NOT WORK for this recipe! Stone Ground Grits are what you need!! If your brand of grits says Quaker anywhere on them, those grits have been parboiled and blanched of all nutritional value…trash them and get the real deal! I am in the process of making it now. I’m loving that I can use stone-ground grits instead of quick grits. My husband, who ran a stone ground grits mill at a local history museum, really prefers stone ground grits but they just took me too long and too much attention on the stove. I left out the salt completely. He will add what he needs from the salt shaker. He is on a salt-restrictive diet. I am a true southerner and I recently purchased an instant pot. I first made this recipe 2 weeks ago and it turned out perfectly!!. I did not saute the grits as I did not have bacon grease I also live with a vegetarian so bacon grease is out. 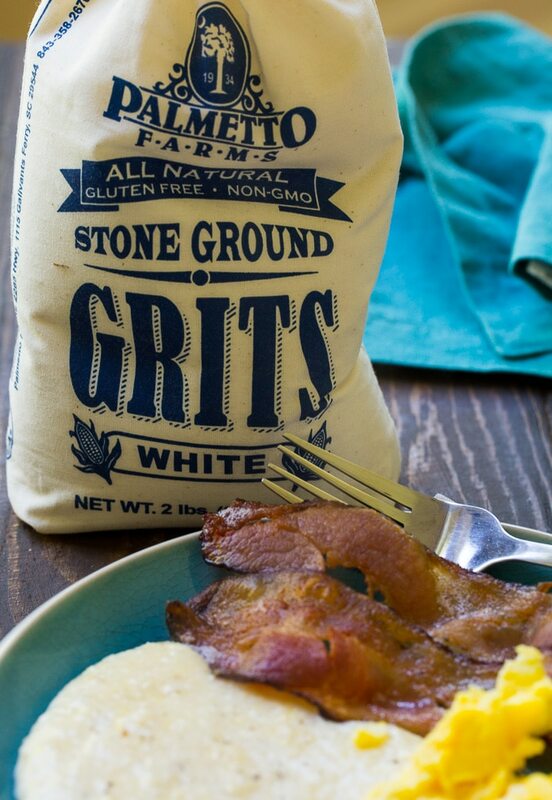 I use McEwen & Sons organic stone ground white grits!! So delicious!!! I recommend this recipe wholeheartedly! I love this recipe when it works but that is about 50% of the time. It keeps burning the grits to the bottom of my instant pot. We tried this last night and the liquid required was way too much. We had to boil the grits on the sauce setting for a half hour to get them anywhere near edible. Did you use instant grits? They don’t have as much fiber, so may have been watery. Just a guess. My IP does not have a high setting. It refers to foods. So what should I set it on? I am new to this. We’ve used this recipe 4 times now and it comes out perfect everytime! My whole family love it! We found non-gmo, locally grown corn, grits at a nearby farm. and they’re delicious with this recipe. I’ve used butter, coconut oil and today, bacon grease and each time they’re delicious. So glad I found this recipe. Thanks so much! I don’t know about others but the salt seemed like a lot so I reduced it to 1 tsp and it was still very salty. Also, my instant pot kept giving me the “burn” warning so it wouldn’t reach pressure. This recipe didn’t work out so well for me. My first recipe in a mini instant pot. I cut the recipe in half. So good and ZERO time stirring and worrying it would stick! Hi. I need to make a large batch of grits for this weekend. How do I do that in the IP? Can I triple the recipe? I was able to double it without a problem a time all! Great! Same cooking time? I’ll double it. Probably use my crockpot too. Thanks! Hi..how do you make a larger portion of gritts? To feed like 40 people? Amazing recipe! Couldn’t be easier and my family loved it! thanks for this recipe – I was looking for a grits recipe in the IP that wasn’t pot in pot. This looks perfect. I have an 8 qt pot – do you have any idea if I could double this recipe?? Did you adjust the time when you doubled the recipe? Much better than my previous recipe; the milk helped it tremendously. Much creamier. I followed your recipe precisely but used homemade pimento cheese. Excellent! I bet it was wonderful with pimento cheese! Best grits I’ve ever had! I love grits and I love my Instant Pot! I have used Jill’s recipe (This Old Gal) for my stone ground grits for a year. This recipe has the proportions of liquid to grits perfectly. The sauté does add a depth of flavor that I really enjoyed. Thanks for another marvelous recipe!